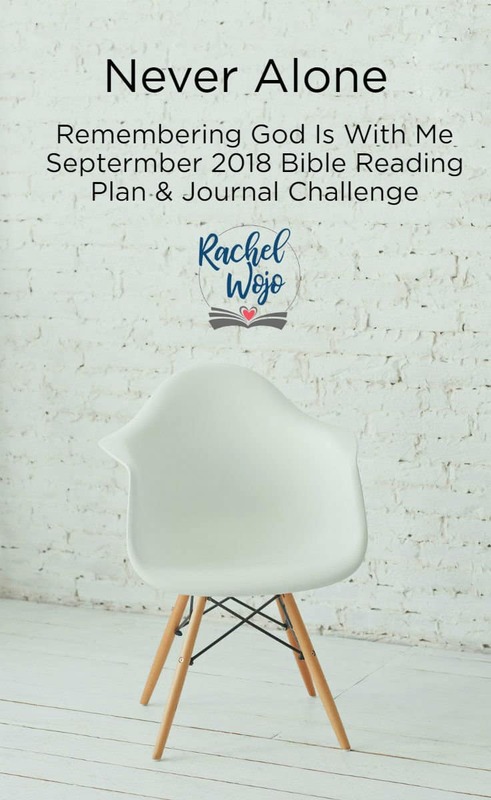 Welcome to the September 2018 Bible reading plan and journal challenge! If this is your first time here, then I’m so glad to have you! Each month I host a monthly Bible reading plan and journal challenge to help our community enjoy reading God’s Word together and encourage our hearts to be faithful to Him. Together, our community have completed over 25 Bible reading challenges, including annual reading challenges and monthly reading challenges. I’ve developed all sorts of strategies to help us continue to stay in God’s word faithfully and there is nothing like this monthly system we are doing together. Have you ever been in a crowded room, yet felt completely alone? Have you ever been surrounded by people, yet felt lonely and isolated? It’s easy to do and yet, truly, as Christians, we are never alone. God has promised over and over in his word that he is ALWAYS with us. Jesus said he would never leave us or forsake us. The enemy is the one who wants us to feel isolated and lonely. If he can get us wrapped up in that feeling, he knows we’ll be paralyzed and stop moving forward with the work God has called us to do. “Go back where I brought you from.” These are the words Jacob heard from God in Genesis 31. Can you imagine all that Jacob had been through up to this point? 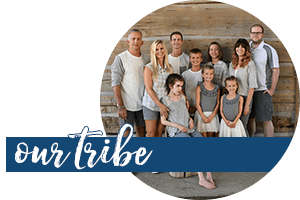 How God had blessed Jacob with the discovery of love, marriage, and family while walking the journey of faith. He was successful with skills in caring for livestock and God used those skills to make him a wealthy man. But now,Jacob’s family members are gossiping and grumbling about his success. God tells him to return to his homeland. Only the reason Jacob left his homeland to begin with was because his own brother wanted to kill him. Who wants to go back home to face that scenario? Sounds like a little reality tv to me. 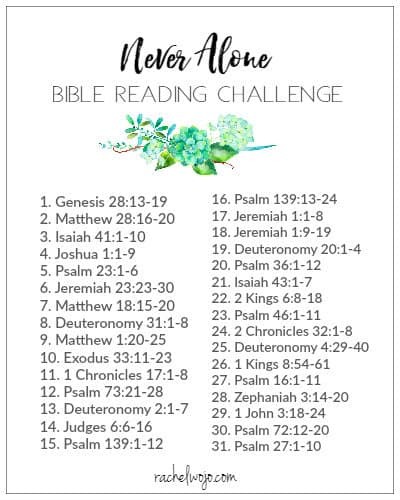 Welcome to the Never Alone Bible reading challenge! If you’ve never joined a Bible reading challenge here before, each day we follow the plan and read the passage. You can share what you are learning on social media or just keep it between you and God. My goal through the reading is to draw closer to Jesus, and I want that for you too! 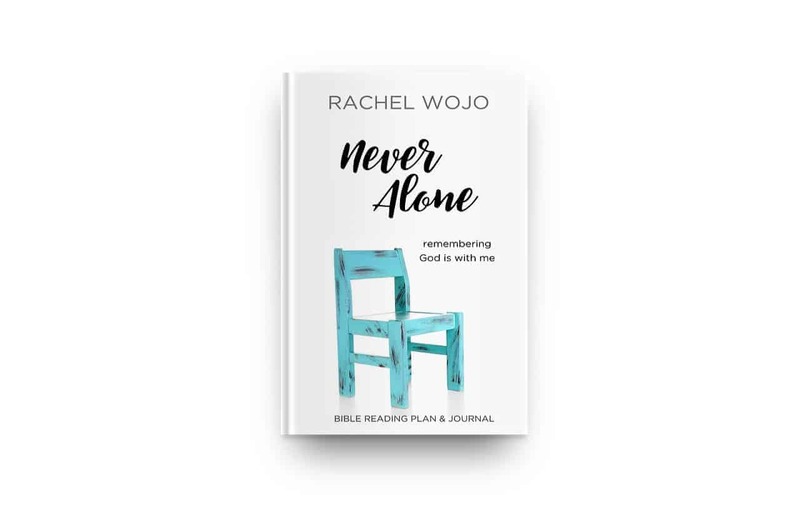 For this month, we will use the hashtags #neveralonejournal and #biblereadingplan. Almost every day, I post on Instagram or Facebook about what I’m learning through the passages and sometimes I post the Bible journaling pages I work on throughout the study. 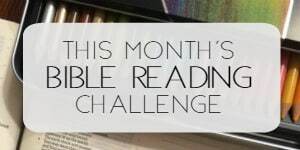 It’s hard to believe that it’s been over a year and a half since God began working in my heart to step the monthly Bible Reading Challenge up another notch. Personally the Lord has convinced me that soaking in his word each day is the best soul treatment I could possibly encounter. 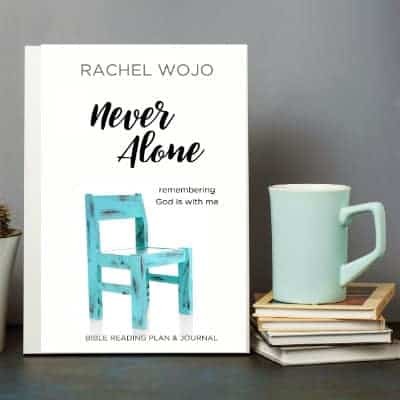 So while our community has completed Bible reading challenges for several years, I knew God was asking me to provide a stronger tool than the simple Bible reading plan printable I offer each month. I am looking forward to become more aware that the Lord is WITH ME each day this month! Thank you so much for encouraging me to dig into God’s Word each and every month as we continue to learn his word and apply it in our daily lives. Who’s in for the challenge? We begin September 1st! Order your journal NOW! Finished day 1. . I enjoy reading the Bible passage and just pondering its meaning. Soaking in God’s word. Letting God speak to me. This plan is just enough to allow me to spend time with God each day. 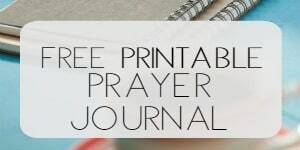 Thank you for creating this Bible plan and journal. thanks for being a part! I’m so glad you are enjoying it!